My Kyivstar system makes Kyivstar subscribers servicing more comfortable and simple. Change tariff plans and submit applications for participating in special offers. Get complex analysis of current mobile communication expenses and expences for previous periods. Find full and structured information about mobile communication services, expenses and balance. 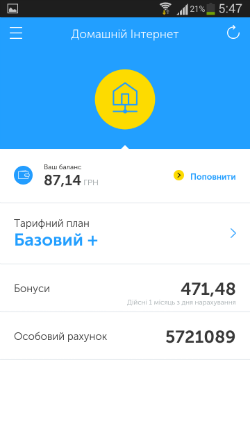 Control balance of every personal account of the company. Get detailed calls reports (date, direction, duration and price). System is available 24 hours 7 days per week. You can visit my.kyivstar.ua website and get all the necessary information any time, without necessity to call to the Kyivstar Help Service. All you need is to use the My Kyivstar system is internet connection and browser. You can trace the most expensive calls, browse the most frequent numbers and receive different types of reports. With the help of the address book located in system you can see not only numbers of your interlocutors, but their names as well. 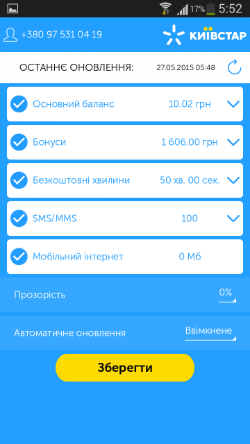 If you lose your phone you can easily restore your address book as the numbers are saved in the My Kyivstar system. The coordinator can grant different access rights for employees. For example, the employee can browse information about his number or personal account only, or get the data limited to certain department. Moreover, there is possibility to grant certain access rights to every colleague. For example, the coordinator can grant administrator permission to any company employee. Every company member can control his own expenses for mobile communication services. There is no monthly service subscription fee. You pay only for detailed bills requested during a current month. Immediately after registration you can scroll through expenses for the current month at a special rate 1 UAH (for each request during a month). The special rate is valid till the end of current month and one more calendar month as well. 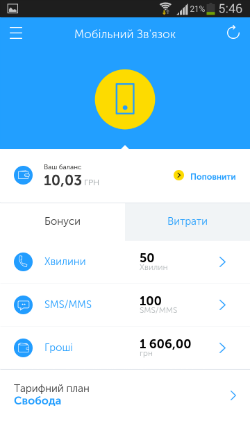 After this period the first request fee during a month is 5 UAH, the fee for all the following requests is 1 UAH per each. Payment for detailed bill is charged from subscriber’s balance. Comfortable, updated application interface makes it easy to manage costs for telecommunications services, activate the available features and apply for participation in promotions, view reports of calls and more. Download the free app on your smartphone you can on Google Play, Windows Phone Store, App Store or appclub.com.ua. How to Become a System User? Visit “Enroll” section and enter your subscriber number in the format +380ХХХХХХХХХ in the enrollment form. To register the indicated subscriber number please dial the combination *100*88*code# on your phone (the code includes the figures shown in the picture in the “Enroll” section). As soon as you receive the information regarding the request acceptance to the number you have indicated, please, push push the “Enroll” button in the system. If all actions have been done correctly, a message with the login and password for the system access will be delivered to the subscriber number you have specified. The login and password are valid for 2 days. 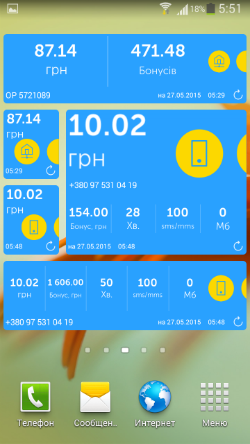 Later on you can use the system web-version on the page www.my.kyivstar.ua. After registration you can get information about your calls and costs of prior periods within 1 year (provided that this period room was not serviced on the terms prepaid). If you have not been using the My Kyivstar self-servicing system for more than 2 years your profile will be removed from the system without any data preservation. * Except the coordinator`s profile..
Corporate and business subscribers can register in the system individually and get access to the information about their subscribers’ numbers without the right to manage the service. To receive additional rights to manage the services connected to your subscriber number you should contact the company coordinator or system administrator and receive the appropriate rights. Visit a Customers Service Center/Corporate Customer Service Department and submit an application to register the coordinator`s rights in the My Kyivstar system. Upon submitting the application a message with login and password for the system access will be sent to the phone number specified in the application if the coordinator has not been enrolled in it yet. Later on the coordinator has the right to manage his colleagues` access level to the system individually. The coordinator has the exclusive right to activate, modify settings or disable the “Analytics” section in the My Kyivstar system. 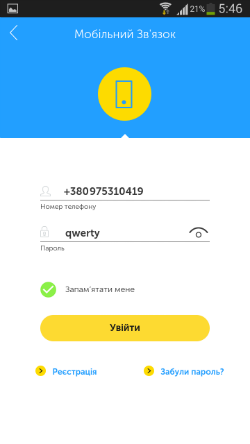 The coordinator whose subscriber number is enrolled in the enterprise code of the company can activate the “Analytics” section via the My Kyivstar system. The coordinator whose subscriber number is not enrolled in the enterprise code of the organization can activate the “Analytics” section only in the Customers Service Centre or Corporate Customer Service Department. All the system information is confidential. Access to it is available exclusively to the personal account owner —the business client’s coordinator. The My Kyivstar system uses HTTPS protocol, which supports data encryption. All software and hardware complex is projected and installed using professional and high-quality equipment. Fill out the application form and wait for a call from our experts. When do you need to call? Thank you for your choice! You will be contacted in the near future by the specified number.